← No Duceys Left in Ducey! Ducey is an attractive market town situated some 10 miles (17km) south east of the area’s major attraction, Mont Saint-Michel. Like much of Normandy, it dates back to Gallo-Roman days of the 1st Century AD. Located on the Selune River, in ancient times, it was an important travel point, fishing center and a link on the salt road from Paris to Granville. 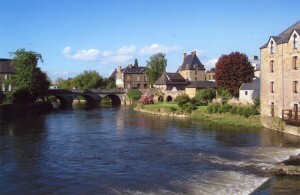 Its Vieux Pont, (Old Bridge), dates back to the 17th Century, as does its historical centerpiece, the Chateau Montgommery. The town’s population is around 2500 and that of the Canton of Ducey (regional district) has a population of about 7450, many of them engaged in agriculture. It’s long-serving and progressive Mayor is Henri-Jacques Dewitte. There are many locations nearby with historic links to Ducey, including Avranches, Pontorson and the abbey at Mont Saint-Michel. The closest major city is Rennes, served by air and high-speed rail. It is also an easy half-day drive from the D-Day Beaches of Normandy. Ducey is located on highway D976 and can be accessed by car off auto routes A84 and E03.